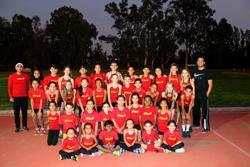 Chino Hills Flash is proud to offer an excellent endurance and speed development for children ages 5-14. It is our philosophy that all children, regardless of current ability level, can be successful and should participate in physical activity. We provide knowledge and support to help them achieve their individual goals,from wanting to feel stronger and more confident to becoming the fastest child in their class, and in competition. Whether their goals are competitive or non competitive, we are here to help. Team Flash promotes fun, friendships, and great performance in an environment that aims to keep kids healthy, happy, and loving the sport of running.